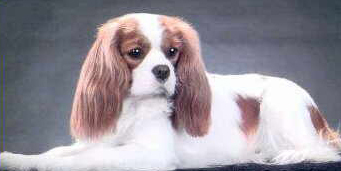 We became involved in the world of Cavalier King Charles Spaniels in 1995. My husband wanted a Bernese Mountain Dog but we realized that breed although lovely, did not fit our life style. So we searched for a breed that had a similar temperament in a smaller package. A good friend of ours, a long time Sheltie breeder and performance person introduced us to the Cavalier King Charles Spaniel and it was love at first sight. 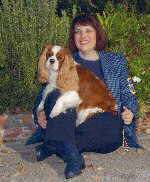 We attended a local Cavalier Fun Match and were fortunate enough to meet a wonderful breeder (little did we know at the time that she was the owner of AKC CH Laughing Partridge Wood Misdemeanor, the first Cavalier in history to place at The Westminster Kennel Club in The Toy Group after Cavaliers were accepted into the AKC Registry) who had a beautiful tricolor boy that was a perfect fit for our household, Lothlorien Graham CGC. 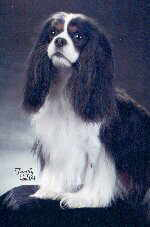 Although we had gotten him as a pet, Graham knew the show ring and one of the first times we showed him he won Best Tricolor in Show at a Cavaliers of The West show under noted English breeder and judge Sylvia Lymer of Lymrey Kennels (UK). And thus, began our interest in the show world. We are always thankful to Graham for teaching us how to show! Our dogs are primarily from the Sanickro (UK), Pinecrest (USA), Laughing (USA), and Judyland Kennels (UK) which go back on the Kindrum, Salador and Ronnoc lines. We feel privileged that these prestigious kennels have given us our start in the Cavalier World with some outstanding examples of the breed. We feel honored to have them in our lives as both friends and mentors. We are actively involved in the The Bay Area Cavalier King Charles Spaniel Club, a regional club of The American Cavalier King Charles Spaniel Club (an AKC affiliated Club) and Cavaliers of the West, a regional club of the CKCSC-USA. I hold a Board position with the BACKCSC, our local AKC Club, and have served as a Board Member for Cavaliers of the West for over ten years. I was also a Director of The Cavalier King Charles Spaniel Health Foundation USA which is dedicated to preserving and improving the heath and well being of the breed. We are members of the CKCSC USA, ACKCSC, Inc and the The CKCS UK Club. I also served as the Representative to the National Board for the CKCSC-USA, and have been an active member of The Nor Cal Toy Dog Fanciers Club and The Eastern Cavalier King Charles Spaniel Society (UK). We are committed to health, temperament and quality in our own breeding program. We dual register all of our Cavaliers. We exhibit our dogs both in the AKC and Cavalier King Charles Spaniel Club-USA show rings. We health test annually with board certified veterinary specialists and do provide health clearances on the dam and sire of all puppies. We test for heart, eyes, hips, patellae, curly coat and episodic falling. All of our Cavaliers live in our home and are a part of our everyday family life. To read more about Loch Lomond Cavaliers as well as the history of our Cavaliers please enjoy reading the The Royal Spaniels Magazines featured on our Ads page. Reprints of both magazines can be ordered online (see Links).